Field Sets are a grouping of fields designed to capture relevant coverage information for particular policy types. For instance, the coverages of HMO, EPO, PPO, and medical could all use the Health field set. Update Coverage types and field sets in the Settings > Data & Custom Fields section. Users with Manage Data, and Manage Custom Fields permissions can work with field sets. From the Profile & Settings icon, select Settings and then go to Data & Custom fields. In Data & Custom Fields area, select the Coverage Type tab. Add and label your coverage type. Define your coverage type by providing a label in the text field. Select the field set for the coverage type. The drop down lists field sets. Select an option for the appropriate field set. Note: Changing an existing coverage type's field set does not impact existing policies. Enter the name of coverage type in the text field. We suggest using a unique and easily recognizable name. Select the field set from the drop down. Choose a field set from the twelve options. Check the active box and then select Add Option. Changing a field set on an existing coverage type does not change the field set for any existing policies. 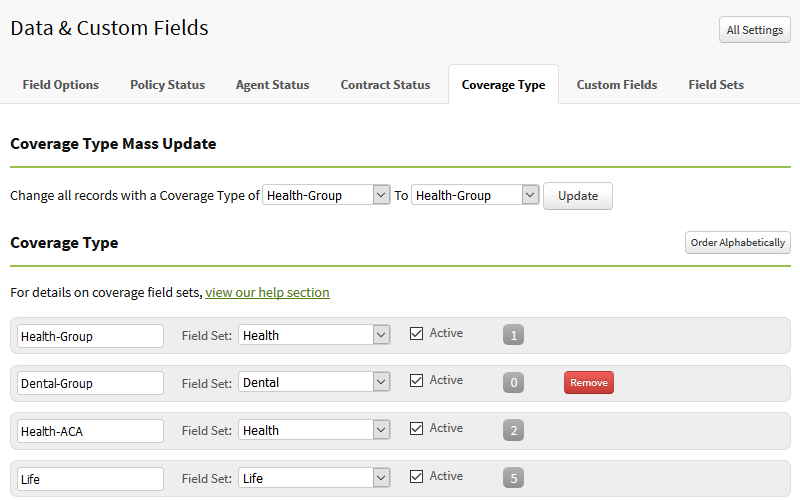 The new field set will only be used for coverages on policies created after you update the field set.